Unlike so many previous filming projects we were extremely lucky, we had an excellent and committed team who worked very hard to make sure that we put together a good short film. People that we had invited to come on the night actually turned up, in fact we got more people to come than had been expected because of the poor weather condition’s. We were lucky that the Council refused us permission to cycle through the Bournemouth Pier approach as this helped to produce a surprisingly good film sequence of the cyclists dismounting their cycles and carrying them across the Pier Approach Although we were expecting this and had storyboarded them pushing their cycles past the camera the effect was much better than we’d envisaged..
We were also lucky that I’d made the last minute change to have a camera operated from the back of the car as the footage from this camera by far produced the best shots. We were lucky in my purchase of the Flip camera just the previous weekend with which the final Flag waving sequence was shot as the Z5 footage was too dark. Finally we were lucky with the weather, it rained continuously right up until just a few hours before filming was to commence and then suddenly it stopped and remained dry throughout filming. Ok maybe not unlucky as better preparation might have avoided some of these. The ambient light was less than anticipated along our planned route for the cameras. In particular the GoPro was unable to work with the available light and produced little footage that was useful. This was a particular disappointment as we had the perfect camera position situated at the top of the cars open tailgate giving a very high viewpoint above the cyclists which would have given the opportunity for cutaways in the final sequence. The Sony Z5’s were equally poor in low light conditions but this footage was able to be enhanced in Post Production although with the loss of some clarity. The Glow bracelets although visible in the dark conditions they were not as effective as we’d hoped as they really needed darker conditions in order to show up and of course this would have been too dark for the cameras. What would I change next time? Whenever I have to film in the dark again some form of artificial lighting will be required, even if its just torches. More preparation time and in particular more time with the equipment before filming just in order to familiarise yourself with what can and what cannot be done. Cover the bases – I think this time around we had just enough people in the team but I think in retrospect another pair of hands to operate a camera would have been very useful. More time – we were running up against a tight deadline throughout the filming and this meant effectively everything had to be done in a single take. With road barriers about to be closed there just was no time to reset the cyclists for another run with cameras located in locations for high angle and side angle shots which we had planned. Research the market to see what the most popular keywords are being entered into Google’s search relating to Video’s and Music. Having done some research recently on Google’s Trends pages it appears that the highest number of searches are for Comedy Videos, Celebrities and the Economy. What’s Next for Fairytale of New York? Marketing, Marketing and yet more Marketing a Viral Video can only be considered a success if in fact it becomes a Viral Video that is shared by people on the Internet and on other forms of Media. Many company’s use some form of paid for Advertising to promote their Video but this is outside of the brief for this project. There is a considerable amount of footage including several minutes on the preparation of the cycles and setting up of the cameras etc. 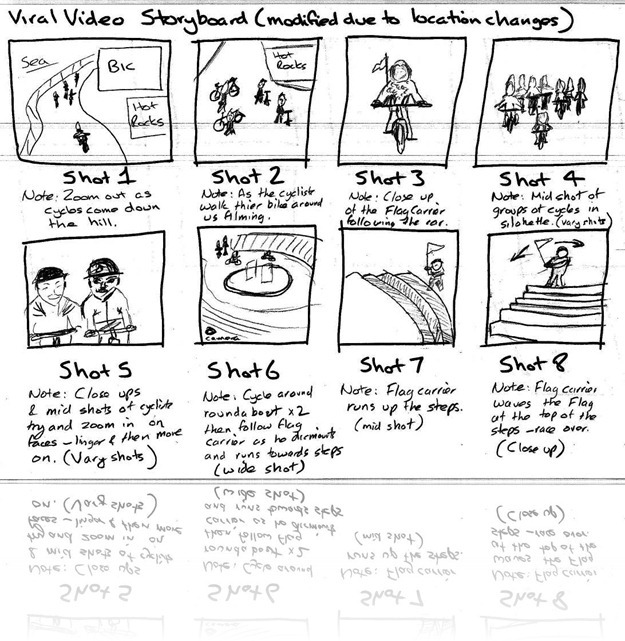 and so it is possible to produce a film of the filming off the Video Viral. Of course there are various alternative edits to explore, the adding of effects etc. If you look at my previous Blog entries there are examples of alternatives including a 30 second version and others with effects added. Also the Team members are also working with the footage and developing their own versions which when uploaded will also have the opportunity to become Viral Videos and will also have the benefit of testing the market to see what works best just by comparing the numbers that have viewed the video. Fairytale of New York – YouTube general licensing allows me to use this music track (non profit) for this project and so in terms of marketing I thought lets try promoting this video as a music video and see how well it performs against the other edits. First let’s start with an apology the film features myself wearing a dodgy hat; in close up, poorly framed but in glorious 1080p HD. YouTube provides the facility of adding annotations to its Videos and these can have links to websites or in this case other videos. This instantly allows the filmmaker to add interaction to their videos. By interaction I mean provide the audience the option to say choose an alternative narration for example a different ending to a video or a link to more information or a menu with even more options. What I’ve produced is very short film introducing the idea of interactivity with two possible endings. I’ve added 2 quotes to the first video sequence and linked these in turn to two other videos which are selected by clicking on one of the quotes by doing this one of the two video sequences is selected. I’ve added a return to each of the possible ending videos so that the viewer can go back and test the alternative choice. Interactive Video Yes or No? With a target runtime of 30 seconds I began to work on editing together a new video sequence using the captured footage used in the full length viral video. With such a short video runtime target I looked through the complete video footage over 7 minutes in total trimming wherever possible leaving only the key elements, action sequences, bike tricks etc. The first edit brought the video length down to 1 minute 45 seconds and so considerably more cutting was required to get down to the target of 30 seconds. After several more passes I finally had a video sequence of the desired length. Building upon the process that I’d applied to the original edit I added lighting effects in order to raise the ambient light levels for the video sequence including trying some new effects levels and parameters which had the desired effect but also did not blur the image as much as some of the effects I’d used previously. I then looked at adding more effects by processing the video sequence in After Effects CS5. By experimentation with a number of effects by trying them each in turn I came across an effect called CC Mr.Smoothie which had a very interesting visual effect on the video (see below). I used YouTube music library to add a soundtrack to each of the sequences. Opened the project file from the previous rough edit (Produced on a PC) and immediately noticed that the frame rate had changed, which caused the video to playback at 25% of the captured frame rate. Resetting the speed/duration of the individual clips restored the frame rate but unfortunately removed all the previous editing points which meant that I effectively had to start over. Fortunately however I still had the video sequence produced from the first edit to refer to, which assisted in identifying where to cut the video. While editing the sequence I looked again to see if there was any improvement possible in increasing the light levels for the individual clips but as the image grew brighter the Blacks became more Grey and there was more evidence of pixilation and graininess. Adding titles and alternative edits. Lee Tucker designed an excellent opening image for the opening titles of the video and I put together the end title pages listing the credits for the video. We also discussed with Jason other possible videos that we could produce from all the additional footage. I agreed to look at a sub 30 second version that would include all the key elements of the film mainly the cycle tricks and close up shots. Lee would look at trying to include some of the footage taken with the GoPro camera combining it with unseen footage from the Sony Z5 cameras where possible matching the low light levels. I plan to suggest to the other team member’s Euan and Michael that they look at producing their own versions as well. Exported the media from Premiere Pro using the QuickTime option with 720p 25fps Pal format in preparation for uploading to YouTube. One of the key elements to completing the assignment is to market the Viral Video as effectively as possible in order to achieve the highest number of viewers. It should be possible to identify the most searched for keywords/tags for this type of video and ensuring that these are incorporated into the description and tag location on the Video upload page. We should then look at direct marketing making sure that all the participants in the video are distributed with the video location and ask them in turn to pass on this information to their friends and other interested people. We should also upload links to the video on our Facebook, Twitter and MySpace pages, forwarding onto friends and subscribers. This Viral marketing option will be enacted upon once all the research on Tags and Keywords has been completed and a marketing strategy agreed, until then I’ve uploaded the video temporarily with no Tags and without a full description or keywords – although I have made the video public so that it can be embedded into Blogs etc. After a lengthy upload 4 hours over night I discovered that the video conversion process used by YouTube and the original QuickTime file format had resulted in a video that was only 480p instead of the 720p HD format that was expected. I decided to look at alternative formats for exporting the Premiere Pro edit. After discussions with both Liam and other team member’s I settled on MPEG2 as a possible format having checked on YouTube’s website and forums for the best format for uploading video’s onto the site. I noticed an immediate difference and benefit in selecting MPEG2 as the resulting file size was only 480MB as compared with the QuickTime file which was 1.46GB this also created upload benefits as the file uploaded and was processed by YouTube in just 20 minutes. A quick check after processing confirmed that the video was available in 720p HD format – success! Reviewing the initial experimentation (See previous Blog) using Premiere Pro it soon became obvious that we were in the lucky position of having almost too much footage for a Viral Video. I decided to approach the next trial with the aim of keeping the total run time of the video to be around 3.30 minutes to a maximum of 5 minutes. Looking through all the footage taken and thought that there was in fact two possible productions that could be produced. One concentrating on the actual cycling footage and the other could be effectively the making of a Viral Video. I experimented with several possible soundtracks and in fact spent an additional evening with the iPod running on Shuffle Mode and making notes of suitable tracks that I had not originally considered. Surprisingly although the original soundtrack I had thought of, that is ‘Saint Saéns – Carnival of the Animals still remained a strong choice, but several other music tracks also became possibilities. In fact the choice of soundtrack totally changed the feel of the video and also the target audience. My new choice of soundtrack chosen both for it’s pace and it’s slightly aggressive tone was ‘Hash Pipe’ by Weezer, with a run time of just over 3 minutes seemed to fill the requirement very well and this also gave me a target for editing the video footage. The first edit came together more easily once the time constraints were in place. It all came down to what could be kept using a runtime of the soundtrack of 3 minutes as a guide, it soon became clear that it would difficult to keep all the footage that I thought was important to the film in and yet still stay within the runtime. After hours in fact the best part of the day I had a rough edit and could then turn my attention to improving the quality of video footage. Due to the necessity of filming at night using available light it was necessary to look at improving the brightness. A mixture of Lighting Effects and adjusting the overall brightness and contrast worked the best, slightly degrading the image quality but a good balance. I’ve had several ideas for adding additional visual effects which will need further investigation and research. One was to insert still images depicting a sequence in the film but looking like photographs complete with white borders turning each still a few degrees with the whole sequence moving through 30 degrees. Another was to attempt a sort of time lapse on flag carrier at one point looking like multiple images coming together into one. Started a New Project in Adobe Premiere Pro CS4 and imported some of the footage from the Video Capture we began on the previous Friday. Selected 2 clips to work on both filmed from the back of my car along the Bournemouth Esplanade from Bournemouth Pier towards Boscombe Pier. One of the video clips came from the Sony Z5 and the other from the GoPro, the initial idea was to try and improve upon the clarity of the video as both were filmed in low light conditions and initial viewing suggests that the available light was insufficient really but we hoped we could improve on this is in post production. Initial results on the GoPro footage was disappointing as despite attempts at introducing brightness to the video had so little effect and added no real benefit. Therefore I’ve decided that in the few instances where street lighting was sufficient to illuminate the cyclists we have to discard most of this footage from the film. However the footage from the Sony Z5 was significantly better and with just a minor amount of Lighting Effects added in Post the footage in it’s majority I felt could be used in the film. In fact I think that it could be used without any real editing this would give approx. six minutes of excellent and continuous video. I also took the opportunity to try a number of different audio tracks with the video footage and determined that the original specification of using Camille Saint-Saéns and The Carnival Of Animals ‘Aquarium’ to be an excellent choice. I also thought that the footage also worked surprisingly with a number of Heavy Metal and Rock tracks including ‘Hash Pipe’ by Weezer and ‘Unforgiven’ by Metallica. The day of filming has arrived and with it an endless list of problems and minor hurdles to negotiate. With the assistance of a good team these organisational issues were eventually solved including a major hurdle that being the closing of the road where we are shooting the video. This meant we had less than half the time we had allotted to the shoot actually available to us on the night. Directorial Change: I made one last minute and possibly the most significant change to the filming process on the night and that was to position a camera and operator in the rear of my car. Initially we were going to only use the GoPro camera to film the cycles following the car along the promenade but as we had had too little time with this camera I decided we could not totally rely on it to produce the results required. In addition I felt that a manually operated camera would be more flexible and could select a variety of different shots I wanted adding to the effect of the bike chase scene. We still used the GoPro camera and affixed it to the tailgate of my car which now in the open position meant we had added another factor/perspective to the film by giving a high angle shot of the cycle chase along the promenade. Lee Tucker the Creative Director made some last minute and what would turn out to be significant purchases, the first was a large flag which we fitted to a fibreglass pole I’d brought with me and the second was 2 sets of battery powered lights which we used to decorate the Flag carrier ‘Jack Driver’ a recent and significant member of our team. With just 2 hours to go and so much to do Michael Moore ‘Producer’ was setting up cameras and at the same time making the Flag and Euan Macquisten working on setting up the second camera and the small tripod to be used in the car. With just 15 minutes to go until the allotted time of the shoot to start the only people there were us, there was no sign of any cyclists but we carried on setting up the equipment and making last minute changes to camera positions to get the shots we wanted. Then the first cyclist arrived, then another and another. As if from nowhere we were suddenly joined by around 30 cyclists including a unicyclist who’d cycled miles to be there. With the assistance of two of Michaels friends we all began snapping Glow sticks bringing them to life and fixing them to the cycles frames and wheels. With 100’s of these attached suddenly we began to see the effect we had envisaged from the start. With Jack draped in the battery powered lights we switched them on and suddenly we began to believe that it would all come together. The penultimate day before filming commenced identified how much there was still to do. A modified permission form was duly completed signed and returned to Bournemouth Councils Events department for consideration. This modified permission form now gave us permission to film at Bournemouth’s Pier Approach, although this does not allow cycling but does allow us to use this location as the assembly point for the cyclists rather than Boscombe Pier and this also gives us an opportunity to film the preparation of the cycles in a secure traffic free location. It was time to use our network of contacts to promote the event and also to make use of Social Websites to reach those people we would be unable to reach any other way. A Public Event was created on Facebook inviting people to join us on the evening with their bikes and hopefully in costume. We each then invited a selection of friend’s to the event and hopefully they in turn passed this onto as many of their friends. We then contacted the AUCB Student Union and requested that they send out an all students email to promote the event and of course inviting as many as possible to attend with their bicycles. Finally we contacted bicycle clubs and cycle interest clubs in the local area to see if any of their members would be interested in taking part. Surprisingly it proved difficult to source a Flag of any description from within the University departments or indeed any resources within the AUCB which meant we had to look elsewhere for a flag. We eventually managed to source a number of Flags from individuals but have yet to decide on which one to use on the evening, leaving this decision until after the initial trials have been completed and deferring the final decision until the last minute. Final decision could be made on the evening itself to see which Flag would work the best in low light conditions. A key member of the cast for the project would be the lead cyclist as they would be both holding the flag and would also be leading the group of cycles along the chosen route. Fortunately another student within FdA Digital Media Production (Jack Driver) is an enthusiastic cyclist and he volunteered to be our flag carrier. 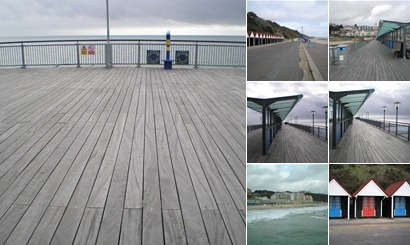 With the original location for the Viral Video ruled out because we were unable to secure permission to film, the alternative location of Boscombe Pier approach and the Undercliff road were deemed acceptable and permission to film granted. With the loss of access to filming some of Bournemouth’s Landmarks the film will instead concentrate on the action, that is the cyclists, the costumes and the lighting effects. I suspect that the film will be successful and could assist in determining whether a sequel possibly filmed in the spring/summer would be even more successful both in attracting larger numbers of participants and allow us to broaden the areas to film. But for this production the idea is to get as much footage as possible on the cyclists, in particular close ups of the cycles, getting a feel for the movement and the effects created by the lighting. This will be a learning process with many obstacles to overcome, possibly the most challenging will be filming at night without providing any additional lighting. There will also be the opportunity to film using several technologies from Mobile Phone cameras, Pocket HD Cameras, the GoPro and the Sony Z5 HD Cameras hopefully fitted with the Digital backs rather than Tape. 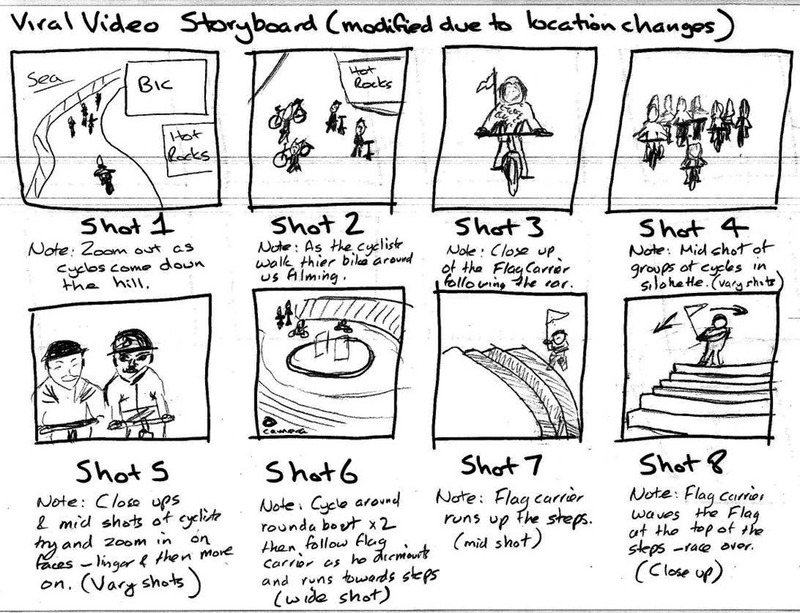 The idea is to experiment with camera positions particularly with the GoPro which can positioned on the back of the bikes on a car and with the addition of mounting it on a pole provide a raised height perspective which could add a unique look to the final film. 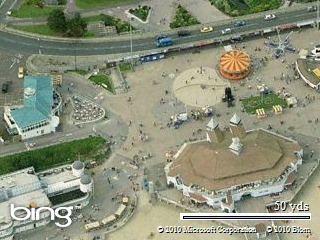 Bournemouth and filming locations. Lee and Michael worked on putting together Aerial maps and marking in the route ready to send onto the Council. With these requirements identified I worked on completing the Filming permission forms and sent these with the maps off to Bournemouth Council for approval. After a number of emails requesting additional information the final email from Bournemouth Council declined the team permission to film in the designated areas because they are no cycling areas. Very disappointing as we were seeking permission to not only film in this location but also permission to cycle in these areas because we knew these areas were usually no cycling areas. So we need to come up with an alternative location which everyone involved can not only get to but which also meets filming requirement’s, but and unfortunately so without being able to film in the Landmark areas of Bournemouth’s Lower Gardens and Pier Approach it is difficult to see how our film could still be representative of Bournemouth. On a positive note initial trials of the Hero GoPro camera went well – Michael is to test the camera at night to see how it performs in the available light we shall most probably experience during filming. We also made a decision on the additional Lighting we were planning to get the cyclists to wear or add to their cycles. Rather than go for LED lighting powered by battery we decided to use Glow sticks, or to be specific Glow Bracelets. A search of the Internet identified a number of sources for these but none local and so following a telephone conversation with a supplier who offered a 20% discount for Education, 300 Glow Bracelets were ordered at a minimal cost.